Izamal is one of 35 locations in México, who received the title of a “Magic City” by the Secretary of Tourism in México. 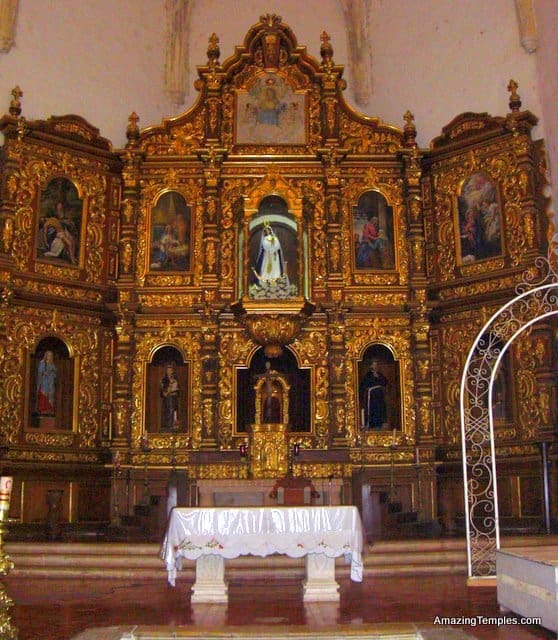 These are mainly unknown towns, but also San Cristobal de las Casas in Chiapas is one of them. The small town of Izamal has 17000 inhabitants. It was built in colonial style and is located about 40 minutes (70 km) east of Merida, in the state of Yucatán on the Yucatán Peninsula. Other nicknames of the city are “Yellow City” which refers to the vast yellow color of the houses and “City of Hills”. 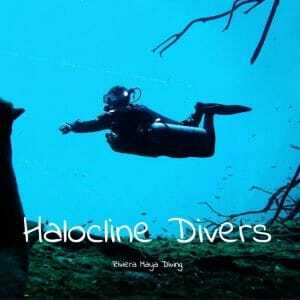 The latter indicates the presence of numerous ancient ruins in the city, dating from the time of the Mayans. 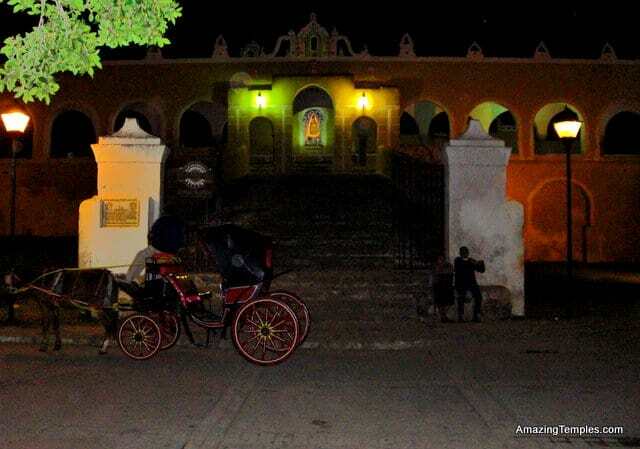 You can visit Izamal while following the route that I described earlier in the post “Getting around Yucatán”. 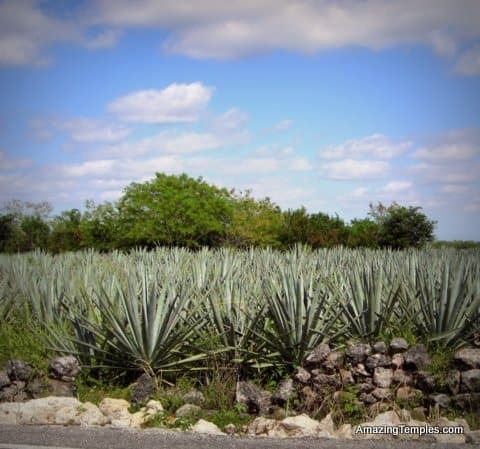 Izamal has great historical significance. 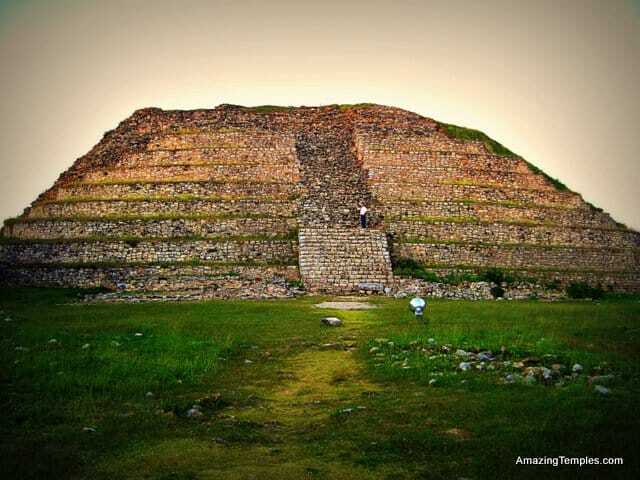 Izamal – Standing on the base level of Kinich Kak Moo – in front the much younger 10 store pyramid that was build on top. 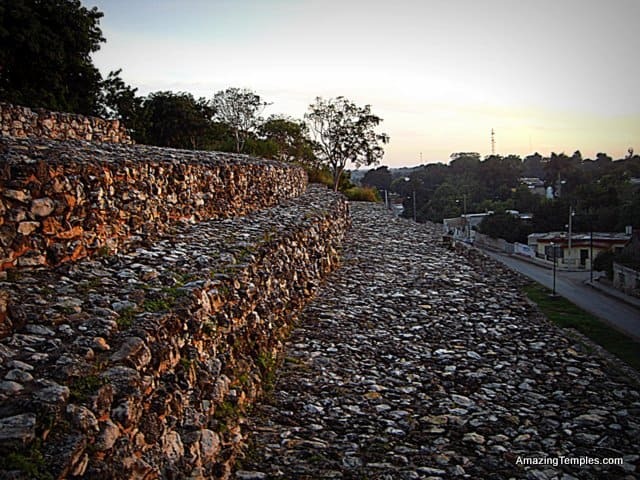 The earliest traces of settlement in Izamal fall into the time of the pre-classical period. But the development into a major city center occurred during the classical period. Izamal was probably the largest Mayan city in northern Yucatán. 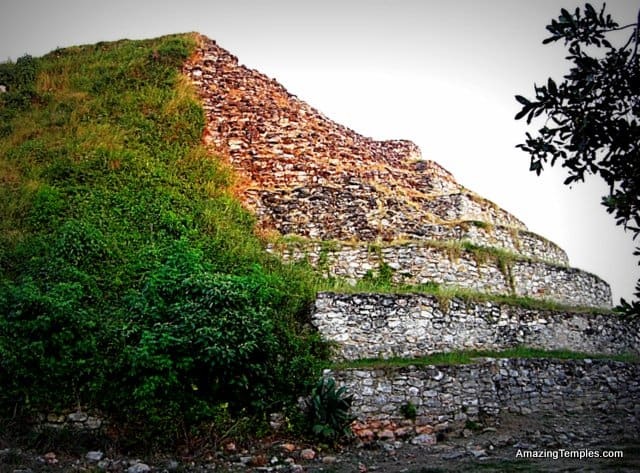 At various points in the middle of the city, you can admire the remains of gigantic pyramids. Izamal was the home of several sanctuaries that were dedicated to the creator god and the sun god. The largest of the pyramids of the city covers an area of ​​8000 square meters and a volume of 700,000 cubic meters. The name of this pyramid is Kinich Kak Moo, it was dedicated to the Sun God . On the basis level of the huge pyramid there is another pyramid temple with ten stores and rounded corners, which dates from the post-classical period. The second great pyramid, which is called P’ap’hol – Chaak was dedicated to the god Izamna. This God was the God who had created the world for the Mayas. How important this sanctuary was can be seen from two facts . For one, the name of the city of Izamal can be derived from it. And secondly, the sanctuary was so important to the Mayans that the pyramid was dismantled by the Spanish conquistadors in part. Instead the spanish built a Franciscan monastery on top. The name of the still existing monastery buildings were named after the saint, San Antonio de Padua. It was completed in 1516. 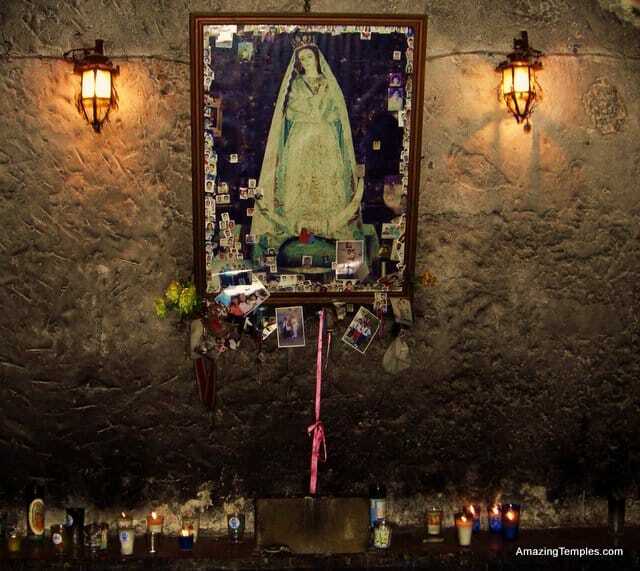 Since they took advantage of the underlying space of the giant pyramid in the construction of the monastery, it has the second largest atrium in the world. Only the Vatican has a corresponding larger area. The pyramids were abused as quarries for the construction of the monastery and the surrounding city buildings. The first bishop of Yucatán resided in Izamal and the fourth bishop Diego di Landa lived here too. Diego di Landa is remembered because he referred to the writings of the Maya as a heretical work of the devil and burned them all. This “Autodafé” didn’t happen in Izamal directly, but in the small twon of Mani south of Merida. Later, however, he wrote the book “Report from Yucatán”, in which he noted the history of the Mayans. This is the oldest document that describes Mayan history and culture. The book provided important clues to the decipherment of the Maya glyphs. Izamal has some hotels and hostels, so that you can stay there comfortably . With over 90 illustrations. In 1562, Friar Diego de Landa conducted an ‘Auto de fé’ in Maní where in addition to 5000 ‘idols,’ he burned 27 books in Maya writing. The document translated here is his apology, and one of the few remaining contemporary texts which describe pre-conquest Mayan society, science, and art in detail. The translator, William Gates, provides background on de Landa, the decline of the Maya, and what is today known about their ancient culture. Thank you………..Lets one wonder what the day to day life is about……….. The world is full of jewels, we just need to find it.